Over the past year, and especially in the past month, I've read a great deal about the concepts of cloud computing, software as a service (Saas) and platform as a service (Paas). There is definitely a reason to get excited about these concepts as people get more and more comfortable moving their data online and connectivity becoming more ubiquitous. Although I think there is a bright future for connected desktop apps (the ones that work like iTunes or TweetDeck), the static desktop application will no longer dominate the marketplace of the future. But what these concepts address is the storage and presentation of my data. Whether it's my music or my banking information, these are data objects that don't currently think for themselves. And I certainly don't have a personal relationship with them. And the way I see the way the internet revolutionizes the world, it's through personal connections. The other day as I was meeting with Scott Wilder, the author of Millennial Leaders and the whiz behind Intuit's brilliant customer community, I realised that there is yet another acronym to throw into the pool of where we are trending towards the future: CaaS or community-as-a-service. 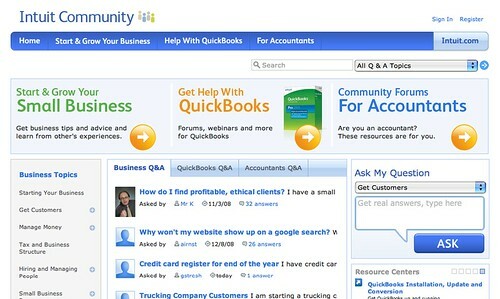 Intuit's customer community is pretty killer amazing. The conversations and connections that happen on there could never be satisfied by machines and data. There are hundreds of unique and nuanced conversations going on daily. These are conversations that go far beyond what Quickbooks, TurboTax or any of Intuit's other software could ever cover. Community-as-a-service is the most challenging of the 'as-a-service' structure of the future as bugs and corrupted data are much easier to fix than flame wars or damaged reputations, but I think it is the most powerful 'as-a-service' offered on the web. Twitter, without it's community would be a webpage. Google's App Engine, without Google's reputation, volume or developer community would hardly be looked at. Alongside the technology comes the human beings using that technology - and the humans would still exist without the technology, the technology would not exist without the human beings. I see a powerful future in SaaS, PaaS and cloud computing, but CaaS is absolutely necessary and core to that future.